Back in Australia now (have been here a month or so) having finished our world trip. Just wanted to say thank you and behalf of the 3 of us for a bloody amazing time. Both in inebriated and sober states. What an intro to Vietnam that first night at Highway 4 was. We were annihilated! I'm heading back to Thailand to spend a fair bit of time there over the next twelve months, and hope to get some more riding in. Probably spend a bit of time in Chiang Mai, so will get to Laos(although I guess I have to bloody fly in and hire a bike there now? ), and Cambodia. 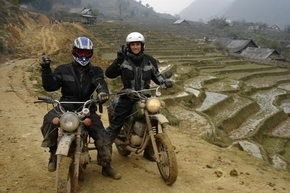 Would be great to come back to Vietnam and do a similar ride with you when the greenery is at its max. We'd both LOVE to go to Mongolia, and now having had a proper look at a map, and realizing how hard it is to get to, it's even more appealing. If you are ever looking for some comrades to head over that way on a ride, please accept this email as an sincere expression of interest. Hope you are both going well, the zeal is selling well, and you aren't consuming too much of your own stock.